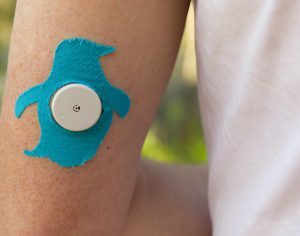 The Libre glucose sensor is fairly robust, but is only rated for 30 minutes in the water and only less than a metre deep. Here’s how I improve on that. In April 2017 I was travelling in Papua New Guinea aboard a small ship on a scouting trip investigating a future photography workshop destination. 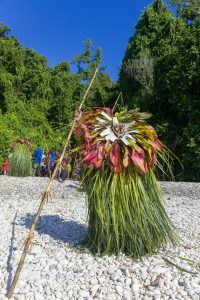 We were aboard for almost two weeks, visiting many islands and villages all the way from Rabaul to Madang. Many days involved snorkelling outings, where we could explore the coral reefs (and wrecked WWII aircraft, and even underwater geothermal springs). 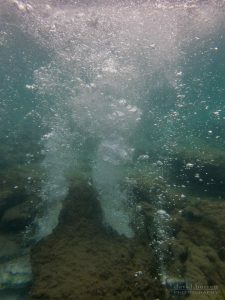 Of course I had an underwater camera with me, and at times ended up spending over an hour in the water at a time, sometimes diving down many metres to get up close to the interesting fish and coral. I had JARVIS (my CGM, which gathers data from my Libre sensor) with me on this trip, but left it onboard for these aquatic outings. I took the Abbott Reader with me in the meantime so I could check even in the wet. When I returned and re-connected, JARVIS would download the missing data from the Libre sensor and then continue. But I needed to be sure the Libre sensor was going to keep working after all that underwater use! The Libre is rated for being underwater down to 1 metre below the surface for up to 30 minutes. I was going to exceed both that depth and that time limit! 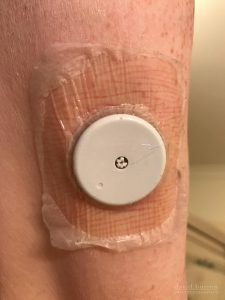 I had found at home when swimming for 30 minutes each day that gradually the Libre sensor’s attachment to my skin would weaken, but I had successfully been using RockTape patches from RockaDex to hold it in place. But I hadn’t tried to push past those 1 metre and 30 minute barriers. The ship’s doctor (whose name incidentally was also David) was very helpful, suggesting a few different surgical dressings to seal the Libre down. 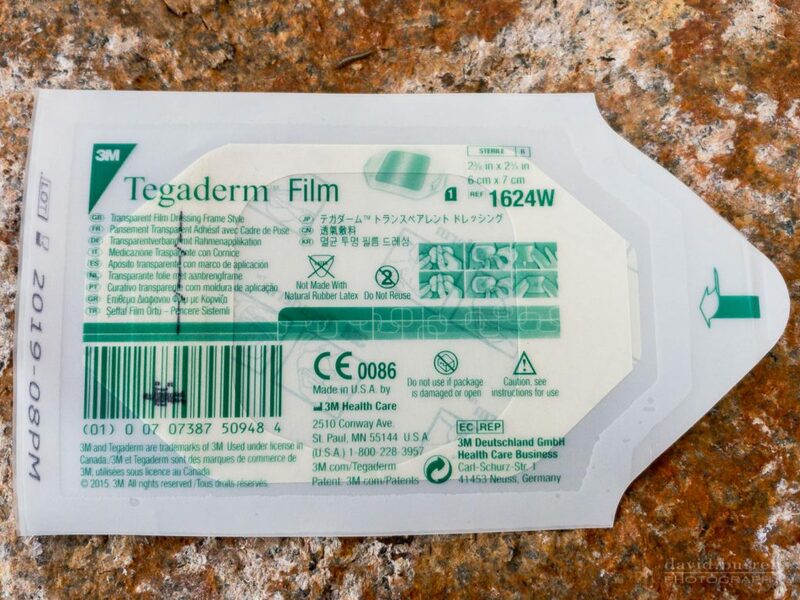 The one we settled on was the Tegaderm Film 1624W. Tegaderm is designed for sealing wounds, but it doesn’t put on an impermeable layer. It is designed to achieve a stable moisture level underneath so that your skin is not adversely affected. 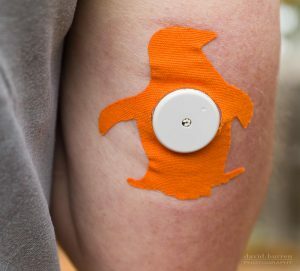 As such it doesn’t seem to disturb the Libre, and the extra protection it does provide let the sensors survive repeated long immersions including dives down to several metres. Where I was in PNG the temperature was almost always at least above 30˚C (the sea temperature too!) and the humidity would have to have often been close to 100%. As I mentioned, I did take the standalone Libre Reader with me on the snorkeling outings (but didn’t take it into the water even though it was in a waterproof pouch). This meant I could swim back to the Zodiac boat my gear was in, grab the Reader and scan my arm to know where I was up to. Years ago I would go for much longer periods without knowing what my actual BG level was, so this didn’t scare me. But a couple of times I did decide to get out of the water for a while and scoff some glucose to avoid a hypo. I used two Libre sensors on that PNG trip (I only changed because the two-week countdown ran out part-way through the trip) and they both worked great. Tegaderm is available in many sizes, but the 1624W size seems perfect for the Libre. It does also suit some other applications. This issue occurs with almost all bandages. Even RockTape starts to lift at the edges. The best solution I’ve found is to use a pair of sharp scissors and trim the loose bits off before they can catch on clothing and lift more off. Of course, your clothes can affect this (e.g. tight thermal tops do rub across the edges of the film a bit and accelerate the process). If it does peel off too much I can carefully remove just the film (leaving the Libre in place) and apply a new layer, but needing to do that is unusual around home where I’m wearing looser clothes. When I got home from PNG I bought a box of 1624W (from MedShop.com.au, although there will be other sources) and have been slowly using them ever since. That box of 100 dressings is going to last me a long time, but it is useful for more than just Libre sensors. Even if I’m not going to be swimming, when I put a new Libre sensor on I immediately apply the Tegaderm. Then I never have to worry about knocking my sensors off (I did lose a few back in 2016). Note that some people have allergic reactions to various adhesives. 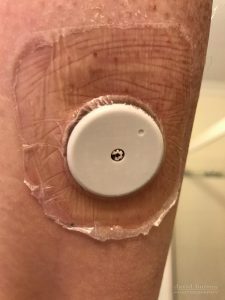 Some react to the adhesive on the Libre but not to that on the Dexcom CGMs, and vice versa. Some people have reactions to Tegaderm, but there are other products such as Opsite Flexfix which may also be useful. The official Abbott guidelines for keeping your sensors stuck down can be found as a PDF online. They do mention Tegaderm IV, but not plain Tegaderm explicitly.